but as you can see that doesn’t mean the kayak launch isn’t being put to good use. Hey Heather – I brought my lunch to the park at the end of Manhattan Ave (what’s the name? 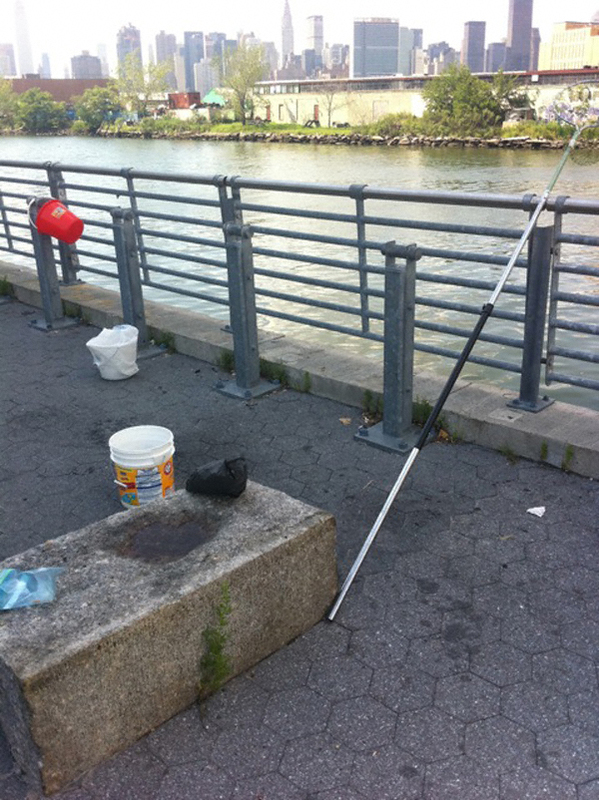 Newtown Creek Park? and came upon a couple of gentlemen who were planning their next meal — right outta the water. 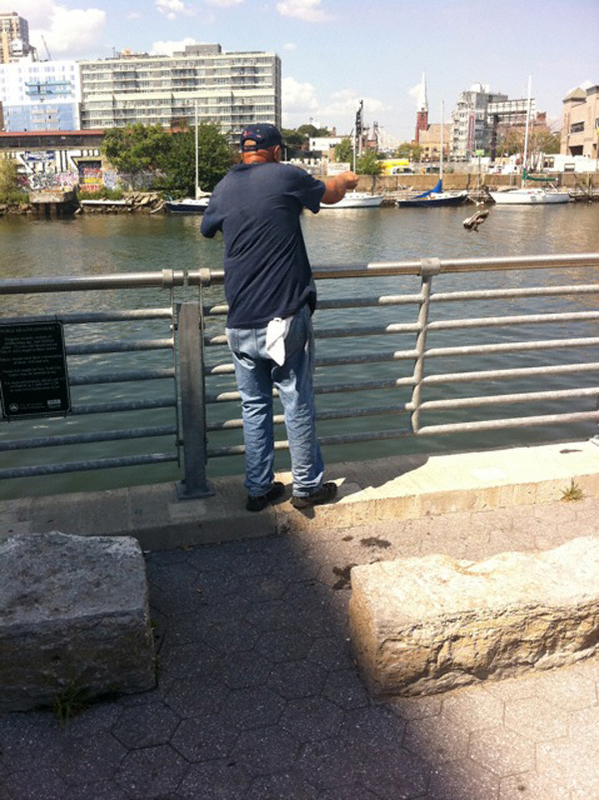 These two fellows were using a raw chicken drumstick as bait for crabs on the bed of the Newtown Creek…. and, boy, were they successful. In just a few minutes they pulled up about a dozen crabs as I watched them toss the chicken leg attached to a rope and haul up crabs two by two (clinging to the chicken leg with their claws). I inquired if they intended to actually eat their catch. And, yes, indeed they were. The one guy I talked to said (in limited English and with hand gestures) that he cleans each crab by putting them in buckets and changing the water ‘four or five times’ over the period of a few hours, then he made a motion like the was scrubbing something with a brush and, finally, the crabs get boiled. have you heard of anyone ever eating crabs from the creek?? …The closest I get to eating shellfish in this town is the Lobster Joint! Believe it or not, I had someone tell me about this chap recently. Hence why I feel compelled to point out one thing Jay overlooked: he uses— no—- make that repurposes—- condoms fished from the creek and uses them for “floaters”. E.g. ; when it bobs up and down that means he has just scored a haul of eightten-legged toxic goodness. Yum! 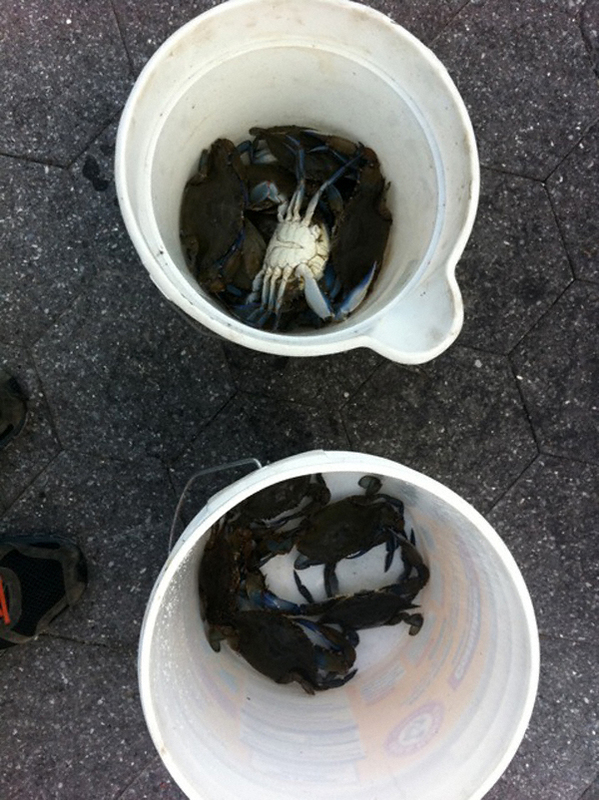 LOTS of people fish and crab from Newtown Creek, from both the Brooklyn and Queens side. In fact, I’ve seen a local Chinese restaurant employee go crabbing there. That was several years ago. But I never got over that and I don’t eat crab from local restaurants anymore. Oops! I forgot to add something. 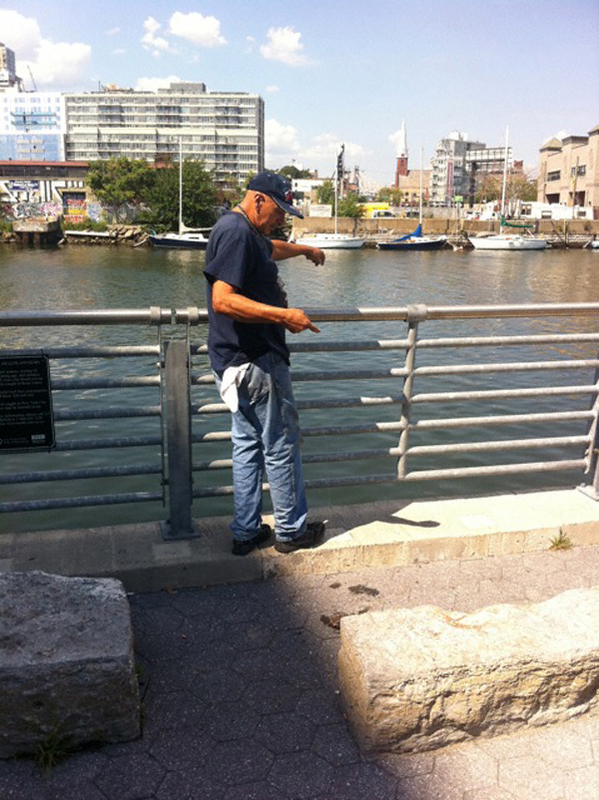 The older Hispanic crabbers insist that there is a sure way of avoiding eating the contaminated portion of a crab. I don’t know if it’s for real or folk lore. Regardless, I’m not convinced enough to eat one. I’d like to cook and serve one to a local polluter though. I saw this guy and his gal pal setting up there the other day. I told him that it was a toxic Superfund site but I’m not sure he understood. Frankly I’m stunned that crabs are actually present. I don’t see how you could avoid eating any contaminants. Generally they are stored in fatty tissue so unless crabs are entirely without lipids, you’re gettin the toxins. The pollution down there is BAD. That’s part of the reason Dewey’s boathouse got scrapped. He can throw as many tantrums as he wants (the folks on the other side of the creek find ’em amusing, by the way.) It ain’t happening.